Turtle Moon Studios. Susan Shie. Turtle Trax 9-1-99. Summer's Almost Done For! Let's Party!!! Above: Farther down in this diary entry, you'll see our wonderful CraftSummer class at Miami U in Oxford, OH, this July 12-16. These students were so very good, they did a carry-in Fiesta Brunch the last morning. You know, the morning we had to make out our grade sheets!!!!! They even made us Bloody Marys, for the whole class!!!! We both think we could get used to this kind of treatment! No problem! We have had quite a Summer here in Northeastern Ohio. First the long drought and heat wave, and now, happily, weeks of cooler weather and intermittent rain. Ahhhh! The critters have waddled back to their normal food supplies, leaving the garden to turn out pretty well, after an earlier plant slaughter. The A/C has had a good rest, after weeks of ozone depleting use. Since Jimmy and I both adore Fall and Spring, the moderate seasons, we are basking in the coolness and refreshment of the post-drought era!!!!! Here's the patch in full recovery, in mid August. It's a lot fuller now, but I don't have a digital camera! Sorry! Looking toward starting more perenials in our big Rainbow Garden, sans tilling this year, we are on the prowl for hardy plants that taste terrible to ground hogs and bunnies! Have you ever taken a healthy chomp out of a Nasturtium leaf??? It's as spicy hot as the blossoms! And since Mr. Groundhog doesn't have any refreshing iced tea handy, he leaves Nasturtiums alone, always to flourish in our patch! I am even ripping out some of these over-enthusiastic vines now, as they crawl mercilessly over the Cosmos, Zinnias, Forget-Me-Nots, and Cilantro. I bet you could grind up Nasturtium leaves and flowers for a nice bug repellent! On, to the tales of our big adventures away from the studios and homestead! In mid July, we headed down to see Gretchen and Mike in Cincinnati, on our way to teaching at CraftSummer, at Miami University in Oxford. We squeezed in an afternoon of shopping along the Clifton-on-the-Gaslight strip, where they live, before going to supper, and then vanishing up to Oxford. 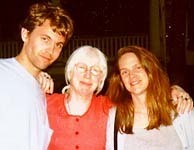 If I could drive, I would bop back and forth, to see our daughter and Mike, a lot more often, if I could drive. I get frustrated and bluesy, wishing we could see them more frequently, but at least we talk on the phone a lot. When we arrived at Climer House, the Miami U. guesthouse, we found a beautiful calico cat, who was living on the front porch of the house. We became very emotionally attached to Callie, but learned that she is a carrier of feline AIDS. One of the staff at Climer House had taken her to the vet, and blood work revealed this fact. If she is taken to a home with other pets, they can get AIDS and die! So we spent the week, looking for a home for her. Everyone on the house staff treated her well, but it's no life for a declawed and spayed cat, having to live outside! We really hope that by now, she is safely ensconced in a kind and loving home! She was such a dear cat, and surely wouldn't last long outside in the Winter! 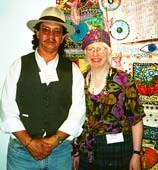 We had 15 hardworking and playful students in our class, Outsider Art Quilts. Here are, at the front table: Vicki Bohland, John Lanzador, and Mary Brackman, all art teachers in the greater Cincinnati area. At the back tables are: Kathy Kopach, Kathy Grimm, and Linda Scholten, with the white fish design on the back of her Hawaiian shirt. Over half of our CraftSummer students have studied with us at least once before, so it was a really wild class, getting off to a fast start! We decided to do one of our t-shirt projects with the class, tho we'd never made 18 shirts at once before!!!! It took two whole days, and everyone had to take solo turns, since only one airbrush could be hooked up at once, with a long enough hose to it, to reach all the work boards. As when we do smaller t-shirt projects, every student takes a turn, making something first on their own shirt, and then making the same thing on all the other shirts. When the fronts are done, we flip over all the shirts and work on the backs. This is the incredible structure Linda and John built, using drawing tables as buttresses, to hold all the work walls up together, so they would be close enough together to reach with the airbrush. I think three times one of the tables slid backwards, bringing its board to the floor with an amazing crash. This was in the room next to the main classroom, and each time, it woke us all up very nicely! No one got hurt, and no one died. This picture is really strange, but what it is is just a guy and his birthday cake! Dennis Tobin, the director of the CraftSummer program, retired from this post at the end of the 1999 season, and so he was feted even more than usual, at the staff and faculty Annual Dennis Birthday Bash, on the last day of classes. His cake actually has a photo image of Dennis as its decorative frosting. All through the five week program, Joyce Ponder, the CraftSummer coordinator, had been sneaking around, having all participants work on a Farewell Book for Dennis. Its cover was made by Terrie Mangat, another CS teacher. Here's Joyce Ponder with her granddaughter Katy. Katy took a children's art class during our week, and made her own quilt. She decided placement for her images by herself, and sewed on her own buttons. In spite of all Joyce's obligations during the program, she managed to bring around her mom, daughter, and granddaughter, to see the classes at various times! Just look at all these happy students! What darlings!!! In front: John, Linda, me, Kathy, and Kristina. In back: Vicki, Pam, Carla, Cathy, Jimmy, Dennis, Mary, Maxine, Karen, Linda, Sarah, and Jann. We are all wearing our cool new CraftSummer Outsider Art Quilt t-shirts, and we even shamed Dennis into wearing the one we secretly made for him. Missing from this photo is Kathy Grimm, who is hereby obligated to be the first person to sign up for our next class at CraftSummer! We hope it'll be next year, and will be Outsider Painted Diary Furniture...or some such elaborate title for painting chairs and other functional wooden stuff. Look how big our Meeper has gotten again!!! She's still eating her crunchies well, and has me trained to take her out to stroll in the grass every morning, with a stunning purple cat leash around her expanding little body! She was quite a fat cat, when she was younger, so we hope she keeps gaining weight and feeling good! I know she's had enough of her "I think I'll just die now" bouts that cycle with the good peroids, that she may get sick again. But let's hope not!!!! Now here are two charming pets! 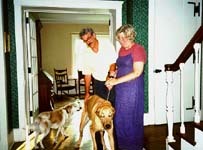 Ayla and Henry rule the house of Mack and Lois Flynn, who let me stay overnight with them, in their gorgeous home, before we took off in a chartered bus, from the Mansfield Art Center, to visit Quilt National, on July 29. Lois is the Education Coordinator for the art center, where The Dishtowel Quilt Project had shown earlier in the summer. Ayla and Henry couldn't make it, to ride the bus, but were very sweet to me! Mack and Lois are just the most charming hosts anyone could hope for!! At 7:30 AM, 48 happy campers boarded this brand new bus, enroute to Athens, Ohio. Here is Danny Butts, the Director of the Mansfield Art Center, as he de-bussed at The Dairy Barn, to see Quilt National '99. Man, this was the biggest bus you ever saw! And it was the first day it got driven! Its fine patterned upholstery matched my hippy skirt...almost, so the bus had a slight resemblance to a Grateful Dead kinda thing! After the QN tour, we drove the Magic Bus to Glenlaurel, a Scottish Country Inn, in the Hocking Hills, where we had an incredible lunch. Later, Jimmy met me in Mansfield, and we and the Flynns went out for supper together, before we came back to Wooster. It was quite a wild adventure, seeing a QN for the second time in one year! This year's show is stunning, and you can never see everything, no matter how many times you look! I could go back and back and back. Think of all the beads I could sew on, before it leaves Athens!!! I was sewing on this piece on the bus trip. 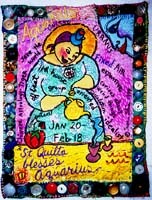 It's "St. Quilta the Comforter Blesses Aquarius, #1," and I quilted and embellished it for quilt artist Rachel Roggel, of Israel. She's giving it to her daughter Bar, for her next birthday, in Aquarius. There are a bunch more of these individually drawn and painted pieces still available, which you can buy as paintings, saintcards, or order to be quilted. Our dear friend Robin Schwalb came out to Wooster for a week of R&R at the beginning of August. Here she is, with her newly started quilt, and the photo xerox of a picture she had taken in Russia, of some mailboxes in an apartment building. 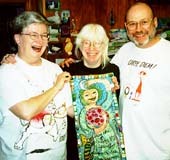 Many years ago, she started her quilt "First Dream" in the same little workroom in our house, and it ended up in Quilt National. The quilt did, not the workroom! So now Robin dug in again and made that space her own studio for a week. She and I work so differently from one another, don't even begin to think she was here for Turtle Art Camp! She was here, hoping to eat fresh tomatoes!!!! 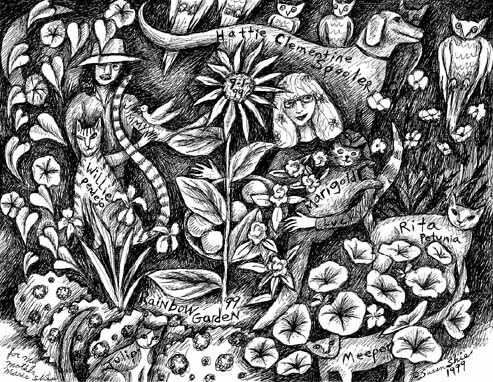 She had missed The Planting of The Rainbow Garden, her usual visiting time of year, and was making up for it. A proud city dweller of Brooklyn, Robin needs to nurture her earthy side out in the boonies of Ohio now and then. Gets those lungs all aired out. Besides, you can't see wild turkeys waddling through a big garden just any old day in the city! We have her hooked! Just look at this healthy swarm of cats! All chowing down on their own ittsy bittsy portion of a little can of Fancy Feast Trout, first thing in the morning, every day. You can hardly see sweet little Marigold, over on the left. She is fat and happy, but just doesn't bounce back much light from the flash, in that corner! Going right, we have Marigold, Tulip (Tulipetra), Willy Pendejo, Rita (Petunia or Foteen), and Meeper (Grace.) They dine on the big table, so Hattie Clementine Spooler will stay outta their food. She's really quite fat enough, thanks. If you've been following my parents' lives at the nursing home, here we are again! Dad turned 84 on August 4, 99. Robin, Jimmy, and I took him a chocolate cherry torte, and we all sang to Dad. He's been busy following all the Cleveland Indians' games, and everyone at the Home knows he's a big fan! If Mom could be her old self, she'd be up outta that wheelchair, talking, and working with us, out in our garden, AND canning and freezing the produce! My nephew Jacob Shie turned 14 on July 31. He's our family's rock and roller, budding master guitarist! He got a new capo and a harmonica from us, and we threw a mini party for him, inviting Robin, Jake's sister Julie, Alex Yomboro, and Paul Schmidt. (In the photo are Alex, Jacob, and Paul, jammin' away!) We all sat out on the patio, I mean the Night Owl Lounge, and sang along when we could. This little jam session was only missing Mike Miller, Gretchen's boyfriend, who had been with these three guitarists for Jimmy's birthday bash, last November. Having lived in The Needle's Eye, a commune focused around accoustic guitar music, we all love to have the tunes rolling out again! On one of Robin's last nights here, we took her to The Barn Restaurant, a local spot complete with huge barn to eat in, and huge duck pond to feed huge ducks at. They don't serve duck, so it's OK. We always take our Turtle Art Campers to this place, with its gigantic salad bar of quasi Mennonite chow...four soups, homemade breads, even three bean salad. Mmmmmmmm, wonder where we're feasting tonight........! Robin did enjoy the restaurant, but you can clearly see that her main fixation, and mine, too, was the ducks! You pay a quarter and get a handful of duck food, and these guys watch every move you make! They really work the crowd! There musta been 200 duckies hanging out, ordering longjohns from the catalog companies, so they can stay here in Food Land, and not have to migrate south for the winter! There are some Canadian Geese there, too. Everybody's happy! I had made the set of "St. Quilta the Comforter Blesses the Fish Widows" paintings over a year ago, but had never made a saintcard out of them. So, now I have. If you're like me, and get ditched for the wonderful world of The Lost Boys and Trout, you will love having your very own little card, with St Q comforting all us wives, who don't tag along to the rivers and streams of the world, to watch our mens twanging that expensive little stick over the water. A girl's just got her limits! 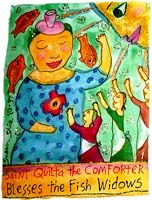 Proud Fish Widows that we are, with lives of our own, we still need a little St. Quilta sympathy now and then!!! Besides The Dishtowel Show, I co-curated a show of art by members of WAGE, Wayne Artists Group Effort, this year, with co-curator Jesse Ewing. 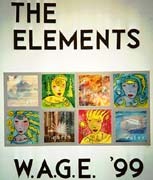 Our theme was "The Elements" and 18 local artists created 21 works for this exhibition, on view now til October 9, at Wayne Center for the Arts in Wooster. Phone 330-264-ARTS. Jesse and I made the collage in this photo, each of us doing a full set of Earth, Air, Fire, and Water "blocks." Jesse's are done on paper, in Photoshop, and mine are on fabric, drawn and painted by hand. The show is a nice balance of many media, including painting, sculpture, fiber, leather, photography, clay, and furniture. Here's part of the artists who worked August 18, to hang our show. From left, back row: Renie Meier, Sally Abbott, Jesse Ewing, Marina Robinson, Jeanne Noble, Susan McMillen, Luis Arango. Front row: Tanya Robinson, Carla Robinson (the very short girl), Cheryl Dixon, me, and Kate Arango. 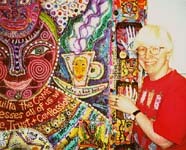 Presenting: Roberta Looney, Queen of the Artists! Roberta is the former director of the art center, and the current assistant director, doing a lot of public relations work now, I think. Luis Arango made her this crown of flowers, which he presented to her at the show's opening, August 20. We all wished we had thought of doing it, too! We couldn't agree more, that Roberta has done so much for the local artists, and continues to be our Number 1 supporter! Before the opening, I called all the artists up, and suggested we all wear hats, gloves, and optional pearls to the gallery that night! Jimmy woulda anyways, but I put on a St. Quilta Acolyte hat that Elizabeth Owen had sent me, and some mardi gras beads, etc, and wore a pair of my mother's white gloves. Our art center board of trustees catered our reception, so the WAGE artists were all able to just enjoy the event, not having to carry in refreshments or serve. We all felt great, in our fancy "get-ups!" Everyone was a good sport and did what they could to come "properly attired." I jumped ahead of the astrology line-up of St. Quilta blessing paintings this month, and did the Y2K Blessing set, while the topic is hot! You can buy both paintings and saintcards of this series now. I couldn't resist putting one of those cute little Macintosh I-Macs in the picture, along with a nice old cheese grater and Marigold, my cat. I promise that the next topic will be St. Quilta Blesses Pisces, as that is where I left off, having finished Sagittarius, Capricorn, and Aquarius. Eventually, I'll get them all! My cousin Richard Snyder and his wife Elizabeth came to the WAGE show opening and also to our studios, to pick up her quilt commission. They were in town, down from Altoona, Wisconsin, for Richard's dad's 80th birthday party. Uncle Floyd is my mother's next younger brother. It was really nice to have Liz and Richard over to our place. She has been my biggest art supporter in the whole family! And it's a really good family! You know it does our old hearts good to finally outsmart Mr. Evil Groundhog! For many years, one after another beastie has systematically ripped down our growing sunflowers, one stalk per day, at its leisure. We took a while to catch on, but finally realized that you can grow sunflowers up by the house, right behind our bedroom, where the EGs are afraid to dine or shred. Here we are, outstanding in our field, as it were, with our tall and brightly colored beauties! And they aren't even full grown yet, in this photo. This is great! By this writing, some of them are 8 feet tall. And maybe the EGs died in the drought, as there are volunteer sunflowers, small but very pretty, standing unmolested in the garden! What a joy! It is amazing, how territory can turn a sweet little pacifist into a raging war monger!